Business Card Plays Tetris. Never Be Unemployed Again. Lots of people have business cards, but most cards are unfortunately kind of forgettable. Not this business card, though—this one is more likely to be a time sink, thanks to the playable Tetris it features. The card belongs to Kevin Bates, and it can be played for up to ten hours. 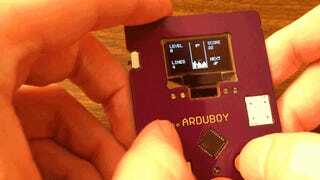 He used an Arduino board and an OLED display, and he's hoping to raise money to sell cards with similar interactive capacities according to his website.